When I started listening to these UNIT audio plays, I really wasn’t sure what to expect. I loved the short prequel that kicked the whole thing off because it kept me on the edge of my seat the entire way through and literally nothing I thought was going to happen actually happened. And The Brigadier was in it. So how could that be bad? I figured if the intro was that good, then it was absolutely worth the five whole dollars to buy the first part of the series, which is UNIT: Time Heals. I figured that, if nothing else, The Brig was in that a bit too so I’d probably like it. I’ve had issues with UNIT ever since he retired because I’ve never been able to take any of its leaders seriously. I’m sorry, but I’ve never really been a fan of Brigadier Bambera because of her relationship with Ancelyn. That was just too much of a stretch even for me. 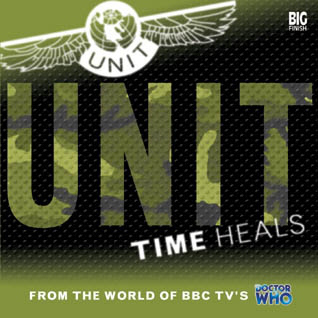 When new Doctor Who brought UNIT back into the picture right off the bat in 2005, I still didn’t like them. And then I actually liked them less when Martha Jones joined up a few series later. I’ll admit that I quite enjoyed the Doctor’s fanboy, Professor Malcolm Taylor, in The Dead Planet, but other than him, I’d gone completely off UNIT until Kate Stewart walked into Amy and Rory’s house. The play is only 70 minutes long, and they manage to pack so much into that time that at first I thought it would be hard to follow. There are unexplained attacks, time jumps, horrific accidents, and an enormous animosity building between UNIT and the government-controlled organization who will be taking their place, ICIS (which I admit is a rather unfortunate name nowadays, but this was made in 2004, so bear that in mind). It seems like a lot, but actually it’s so well directed that it’s not difficult to follow at all as long as you keep paying attention. The small size of the cast really helps too because there aren’t as many voices to keep track of. I was really impressed with the writing as well. I would think writing an audio play would be rather difficult and that you’d run out of varying ways to tell a story with dialogue. But they did a wonderful thing by choosing to break the telling of the story up into different formats. It’s not limited to two-sided conversations. There are phone calls, emails, news reports, and of course the retired General Sir Alistair Gordon Lethbridge Stewart talking to himself while he does things his wife wouldn’t approve of–i.e. setting himself up as bait and doing what sounds to be a fair bit of drinking (okay, some of it was coffee). I enjoyed the introduction of the interloper C.O., Colonel Robert Dalton who, until he’s shoved onto a plane from Syria, is regular army and has literally no idea what UNIT actually does. His taking over as commanding officer combined with Emily having to break him in creates a great deal of tension and it’s hard to be at all sure of him until the very end of this installment. I’m really wondering now where things will stand between him and Colonel Chaudhry in the next part. The (essentially mad) scientists we hear working on and off on some major project for ICIS are a bit interesting. I like a surprise. I was a bit disappointed to realize what they were doing so early on, but the role reversal that took place later on in their little arc made up for it. I like a surprise. There’s also very little mention of the Doctor in this. I thought that would bother me, but I’ve found so far that I’m not really missing him. Another surprise. My only major criticism of the entire thing is the overuse of sound effects. I understand why they’re there and they do fulfill the task they’re meant to perform, but I feel like it’s all a bit much. The never ending sirens might keep us in the moment, but when they’re overpowering a good deal of dialogue, that’s not so good. So was it worth my $5? Absolutely. And since I’m invested in the story now, I went really crazy and grabbed the rest of the series as well. And this time I’m anticipating no buyer’s remorse! * Emily and Will work and travel with the Doctor in the short stories The Terror of the Darkness, Incongruous Details, Defining Patterns, and Faithful Friends (Part 3) as part of theShort Trips series.